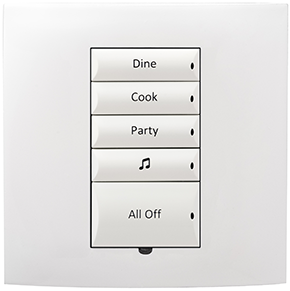 The new square wired keypad combines elegant European design with flexibility, providing a remarkable modern interface which allows complete control over a home’s lighting, music, security and much more. Available in a variety of glossy colours, as well as custom engraving to enable buttons to be clearly identified, every keypad can be configured to include two to seven buttons of four different sizes depending on your needs. This means every keypad is custom made to your requirements, allowing up to 37 possible configurations when it comes to easily controlling your entertainment systems and lighting features. This new keypad design is also extremely versatile, coming with backlit buttons which allows the keypad to be effortlessly controlled and read regardless of whether it’s day or night. The new controllers will be available to purchased and distributed to homes and offices across the globe from mid-November 2013. The new keypad forms another example of a wireless lighting innovation which has seen Control4 receive a substantial number of awards in the past year. At the annual CEDIA Expo (Custom Electronic Design Installation Association), their range was selected as the best of the best, winning the 2013 CE Pro BEST prize for wireless lighting. Control4 were also awarded the CEDIA Best New Product prize thanks to their new Wireless Music Bridge product, which wirelessly connects music collections from streaming music services like Pandora and Spotify on computers to household speakers, mobile phones and touchscreen tablets. For more information please visit Control4’s official website at www.control4.com, where you can find out more about this new technology as well as locate your local dealer of the latest state-of-the-art technology from Control4.